Abalone shells are found off the coast or North America, New Zealand, Australia and Japan. 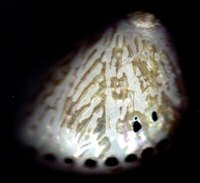 Abalone shells normally have a row of respiratory holes along the outside of the shell. The mother-of-pearl on the inside of the shell comes in a variety of iridescent colors. Once the shells are cleaned and polished, they are quite beautiful. Abalone shells come in a variety of sizes and is a popular medium for jewelry and decorative items. Remove any pieces or barnacles or worms by hitting them with a small metal bar. Remove as much as you can. Scrub the outside of the shell with a wire brush. Use firm pressure with a back-and-forth motion. Fill your bucket 3/4 full with water. Soak the abalone shell for a few days to loosen any remaining debris. Allow to dry and then give it a final scrub with your wire brush. If it is raining outside, set the shells near a downspout and let the water spill onto them. Apply a small amount of vitamin E oil to your fingertips and rub onto the inside and outside of your abalone shell to polish. Use a quick circular motion. If the shell has sharp edges, use a wash cloth. Reapply the vitamin E oil as needed. Before using seashells as home decor or in crafts and jewelry making, you can bring out their true beauty by polishing them.